"We haven't talked about music," He said. I instinctively shrank back into the cushion of the seat, shuddering at the expectant look on his face. I could tell he was excited about this -- excited to confirm that we were compatible as friends because we both cried little baby tears the first time we heard Led Zeppelin's "Stairway to Heaven." "I'm not really good with music," I responded shyly, my cheeks already developing a deep pink hue. "I mean, I like music... I just... I don't think about it that much." "Well, what are your five favorite albums of all time?" He pressed, not content to let my lame answer float awkwardly in the air siphoning the oxygen out of the car. I grimaced, not sure where to even begin. "Umm...." I stalled. "I guess one of them would be U2's 'All That You Can't Leave Behind...'"
"That's a lie," I thought as soon as the words left my lips. The only reason I'd said it was because I'd seen it listed in one of those lists of "Best Albums of All Time" a few years prior. At the time, I'd been overly proud that I actually owned one of the CD's on the list. Music was never a big part of my life when I was growing up. Sure, my family and I would listen to the Beach Boys and Neil Diamond on road trips up the coast, and I was fascinated by my mom's old Elvis Presley albums as a child (particularly the song "Hound Dog"), but popular music wasn't something we openly shared. Even when my brothers and I were teenagers, our house was disconcertingly devoid of lyrical sound. We didn't blast Pearl Jam or Nirvana from our rooms at excessive volumes or glue ourselves to the couch watching obscene MTV videos after school. It wasn't that I didn't want to make my parents' ears bleed by playing Green Day's "Basket Case" on repeat while I was pretending to do Algebra homework, I just didn't feel comfortable exposing myself in that way since the precedent had never been pre-established by my older brothers. I followed their lead, studying to a silent soundtrack. It was only when no one was home that I would dare listen to whatever music my friends at school were talking about during recess. Even today, as a grown woman completely comfortable in my skin, I struggle to define my musical tastes without the influence of others. I know what I like, I know what I want to play on repeat over and over again until my upstairs neighbor stages an intervention, but I still don't know how to confidently answer questions about my musical preferences without wondering how it reflects on me as person. It immediately takes me back to that vulnerable state I experienced as a teenager pretending to know all about No Doubt's latest single when I had no idea who the band even was. Fortunately, my exposure to music dramatically increased in college and my authentic appreciation for it grew along with it. It was there, in a safety bubble of self-discovery, that I found a connection with the music that I still circle back to today because it represents what I still consider, as the cliche goes, "the best years of my life." Of course, that doesn't make it any less embarrassing for me to share it out loud. To admit that I still think the Garden State soundtrack is the best compilation CD of all time, that Fiona Apple's "When the Pawn" spends more time in my CD player than any other in my collection, and that I still get unreasonably excited when I hear a song from Kelly Clarkson's "Breakaway." I like Coldplay's "A Rush of Blood to the Head," Jack Johnson's "Brushfire Fairytales," Nickel Creek, Subliime, Jamie Cullum's "Twentysomething," and other bands and musicians that nobody would ever define as revolutionary or off-the-beaten path. At the moment, I'm obsessing over Bon Iver (especially now that I know how to pronounce his name correctly), Adele, and Florence and the Machine. It doesn't make me any different or exciting to the true music enthusiast who bleeds the Rolling Stones and quotes lyrics like I do "Friends" episodes, but it does make me true to myself. A girl who is not really good with music and sees nothing wrong with listening to Top 40. This quinoa and tofu dish, my new favorite recipe of the moment, isn't all that different or revolutionary either. It's merely a remix of the cabbage cups I posted about last week -- the same ingredients, rearranged and prepared in a different way. I've been playing it on repeat for the past three weeks, but I'm not in the least bit embarrassed to admit it. I'm blasting it out for all the world to hear. Heat a large nonstick pan over medium-high heat. Once hot, add the rinsed quinoa and toast over medium heat, stirring frequently until lightly browned, approximately 5-7 minutes. Bring 1 3/4 cups of water to boil in a large pot. Add the toasted quinoa, lower heat and simmer, covered, until all the water has been absorbed, approximately 15-20 minutes. Remove lid, fluff with a fork and let rest for 15 minutes or so to "dry out." Combine the sauce ingredients in a small bowl. Whisk together until well-combined. Set aside. Heat the same pan used to toast the quinoa over medium-high heat. Add the olive oil, swirling to coat the base of the pan. Add the onion, garlic and tofu cubes, and reduce the heat to medium. Saute, stirring frequently for 10 or so minutes until the onions are tender and tofu is lightly browned on all sides. Add the mushrooms and shredded cabbage, and continue sauteing and stirring for another 5-7 minutes or until they have softened. Stir in the quinoa and shelled edamame, then add the teriyaki sauce. Increase the heat for 1-2 minutes to heat everything through and then stir in the sesame seeds. Serve immediately topped with cashews. "We'll have one of each dessert," My friend announced. Our server laughed, smiling to acknowledge that yes, all the desserts did sound amazing. "No really, we want all of them." My friend repeated. "You can just bring them out as they are ready if that's easiest." Our server looked back and forth between us, waiting for one of us to jump in with a well-timed "Gotcha!" or "Just kidding... we hate carbs!" After a few silent, uncomfortable beats, she finally understood. We actually wanted to order the entire dessert menu. "That's... awesome," She said, breaking out into a genuine grin as she raced off to the kitchen of my favorite new local restaurant to put in our unorthodox request. I couldn't help but feel a surge of giddiness. Earlier in the evening it seemed our meal was going in the opposite direction -- that we were going to be the "good" versions of our gastronomical selves. We'd split the small "spretzel" with mustard as an "appetizer," kept our imbibing to singular glasses of wine, and, sin of all sins, each ordered the wild salmon... with spring vegetables. While the salmon was, incidentally, wonderful -- particularly with the vibrant green garlic aioli -- the substance of our dinner was borderline comatose. We were mirroring each other's motions, moving fork for fork, nursing our respective glasses of Sancerre and Rose like we were on a mission to stay as sober as possible. You know, doing the typical girly thing that girls do lest one stand out as "the fat one" by plowing through the pork belly starter and the steak frites, while the other picks at a lifeless pile of overpriced arugula. While we were perfectly content to keep our entrees light this particular evening, neither of us wanted to be on the losing end of a game of dessert chicken. We both wanted it - and not just one that we'd have to politely share, timidly siphoning off small bites while the ice cream became a soupy puddle on the plate. We wanted more than one -- we wanted all six desserts on the menu. The chocolate buck cake with cardamom coffee ice cream. The tangelo custard pie with tangelo caramel and tangelo ice cream. The grapefruit and meyer lemon fool with coconut cake, meringue and shortbread hearts. The black & tan ice cream bar with barley, chocolate wafers and hot fudge. The meyer lemon beignets with huckleberry compote and key lime ice cream. And the piece de resistance -- the rhubarb roly poly with blood orange-rhubarb jam and lemon balm ice cream. It was totally over-the-top gluttonous. It was totally over-the-top financially irresponsible. It was totally over-the-top ridiculous. And it was totally over-the-top amazing. If you've never ordered the entire dessert menu at a restaurant before, I highly recommend doing it now. And I highly recommend eating this for lunch the day after. Notes: This recipe is inspired by the Shiitake and Tofu Lettuce Cups at True Food Kitchen that I recently enjoyed for lunch the day after a different kind of over-the-top indulgent evening. I loved the way the warm tofu and shiitake mushooms contrasted with the cool lettuce cups and was immediately obsessed with the idea of recreating it at home. I used savoy cabbage in my version -- it's a sturdier vehicle and adds an added dimension of flavor. I also added edamame for a punch of color to break up the monotony of the filling. Feel free to play around with the contents -- scallions, water chestnuts, even slivered carrots all make sense here. Heat large nonstick pan over medium-high heat. Add the olive oil, swirling to coat the base of the pan. Add the onion, garlic and tofu cubes, and reduce the heat to medium. Saute, stirring frequently for 10 or so minutes until the onions are tender and tofu is lightly browned on all sides. Add the mushrooms, and continue sauteing and stirring for another 5 minutes or until they have softened. Toss in the shelled edamame, then the teriyaki sauce. Increase the heat for 1-2 minutes to heat everything through and then stir in the sesame seeds. Divide the tofu/mushroom mixture between the cabbage leaves. Top with cashews. Eat immediately. "What are you doing for Easter?" He asked. A million thoughts started coursing through my head at once. He wants to see me. He's asking me out. On Easter? I have a family brunch... I need to make budino... do my taxes. But he wants to see me! Me! I have to go. What am I gong to wear? The grey ropey dress? My new shirt dress? A new outfit? Should I go shopping? When can I go shopping? I don't have time for this! "Why do you ask?" I texted back, playing it cool while my head nearly exploded. He was making a lamb feast -- wanted me to come. He told me to bring "the fam," bring whoever, but my head kept swirling around the singular thought, "He wants to see me." After months of equal parts exhilarating and infuriating texting it was revolutionary -- the first time he'd suggested a concrete opportunity to see each other rather than vague hints at "hanging out." It made it all the more crushing when it didn't end up working out for me to go. And even worse when despite my apologies and coy attempts at humor, he brushed me off like a fleck of sea salt. Like nothing that we had shared even mattered. On the other side of a week, I can still taste the disappointment. Not just from not getting to see him, but from the end of a crush that consumed far too many of my thoughts during the months it was going on. I'm cutting myself off now. Focusing inward, focusing outward on new and old friends, and cooking and running and writing and drinking beer (!) and doing all the things I love to do when I'm not busy clinging to my phone waiting for someone to send me a text message. Because I don't need a blinking green light to make me feel valuable. And I don't need a crush to feel equal parts exhilarated and infuriated. I don't need any of that maddening, noncommital nonsense at all. I'm moving on. Turning my face toward a new season. Amidst the fury of this fall and winter -- the fall and winter of "The Crush," I also fell hard for Brussels sprouts. I bought pounds of them at the Farmer's Market every Sunday, ordered them every time I saw them on a menu, and prepared them a hundred different ways. I tossed them with miso dressing and crispy shallots, I roasted them with a slew of winter vegetables and drizzled them with a lemony tahini dressing, and I sauteed ribbons of them to tuck into fried quinoa "rice." But my favorite way to eat them this winter was dry-roasted until super crispy, then accessorized with a hard boiled egg, capers, parsley, and a tangy lemon-parmesan dressing. When I made it this past week, the Brussels sprouts had lost some of their appeal -- had become a bit more bitter than usual due to the change in weather. "Time to move on," I thought as I discarded the overgrown stems and outer shells into the trash bin. Time to embrace a new season -- of vegetables and crushes. Notes: You'll notice I don't use olive oil to roast the Brussels sprouts in this recipe. This isn't a mistake. For some reason I've noticed I get a crispier sprout when I dry roast them than when I toss them in oil. If you are worried about them sticking to your pan, feel free to drizzle a bit of oil on the surface. Place a baking sheet in the oven and preheat the oven to 400 degrees. Once preheated, toss the Brussels sprouts with salt and pepper then place the open halves directly on the hot pan. Remove a few of the outer leaves and scatter across the pan. Roast for approximately 15 minutes, peeking in every few minutes to remove any leaves that are crisping up. While sprouts are roasting, whisk together lemon juice, olive oil, whole grain mustard, and parmesan. Set aside. 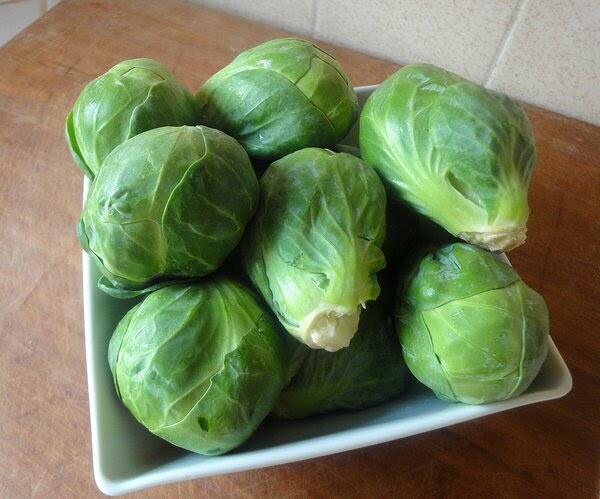 When sprouts are just tender in the center and crisp around the edges and interior crevices, remove from the oven. Toss with egg, capers, parsley, and lemon zest and serve immediately. Drizzle with the dressing to taste. From an outsider's perspective, I act like the typical Virgo -- meticulous about filing every single work email into the correct folder and subfolder in Outlook, fastidious about prepping and dividing my work lunches for the week into individual BPA-free tupperware, obsessive about the grammatical composition of every type of correspondence I author in the office. You know, all the things that make me perilously close to losing my mind over a comma or hand-torn, homemade crouton being out of place. As soon as I leave the office or the kitchen, however, a different side to my personality emerges -- a lazy, disorganized side that can't even be bothered to take in the mail for an entire week. And only then because it's so jam-packed that the mailman can't even fit the Trader Joe's "Frequent Flyer" newsletter in. I can't stand sorting the mail, can't stand dealing with excess paper I have to recycle ("Frequent Flyer" included), and can't stand the impending clutter the non-recyclable papers will inevitably make on my coffee table because I'm "too tired" to actually file or shred it. I simply can't be bothered to do things like read the statement from my bank that is likely just there to inform me that I'm pre-approved for a loan, or open the Valentine's Day card my mom sent me lest I have to "deal" with the stray envelope. My disorganization and procrastination extends far beyond the mail. I put off paying bills until the day before they are due, I shy away from calling to schedule personal appointments until they are forced upon me, and I do everything in my power to avoid doing my taxes every year. Which brings me to budino. A month ago, my brother and sister-in-law Amy went to the Pizzeria Mozza in Newport Beach for his birthday dinner. I was worried I'd hyped it up too much -- been too ecstatic about the sea salt-kissed crust, or the way the crackly skin of the squash blossoms gives way to a pillowy tuft of molten ricotta -- but my concerns were quickly put to rest. The next day, my brother called gushing about every aspect of their dinner -- from the burratta to the bianca to the famed butterscotch budino. "And those cookies..." He said, his voice ensconced with reverie. I asserted my agreement -- I too am a big fan of the rosemary pine nut cookies that come on the side of the budino. "You want to make it for us?" He interjected, barely disguising what was clearly a serious request under a thin veneer of laughter. "Do you know how complicated that recipe is?!" I scoffed, immediately dismissing the possibility that I would ever spend three hours making a dessert that, in its entirety, calls for 4+ cups of heavy whipping cream. Two weeks after our phone conversation, however, faced with the impending arrival of tax day, I wasn't quite as quick to dismiss the possibility -- or the excess amounts of whipping cream. "I'll make the budino and the cookies for Easter if you do my taxes for me again this year." I emailed my brother, no longer concerned that it would take me an entire afternoon between the grocery shopping, rosemary-foraging and component-prepping. "It's a deal... and Amy is pregnant so requests an extra large serving!" He responded, his words instantly driving fear into my heart as I realized the enormity of what I'd just offered. "Can I do it?" I wondered for the next two weeks, unsure whether my mere mortal self could replicate something the Nancy Silverton had perfected without a single red curl falling out of place. Clearly I was doomed to fail -- doomed to a fate of curdled, burnt pudding, dry cookies with black bottoms, and a pile of tax documents I didn't have the motivation to open, let alone file. Yet as I began to break down the recipes into their various parts, the fear slowly dissolved. Instead of shying away from the steps like I shy away from the mail that is still stuffed inside my at-capacity mailbox, I felt energized by the prospect of the project -- and the prospect of eating the iconic Mozza dessert in the comfort of home. As I ladled the caramel sauce over each budino, finishing it off with a tuft of whipped cream and flourish of salt, I felt satisfied in a way I never am when I'm pressured into taking care of the business matters that clutter my world outside the office. It wasn't drudgery -- it was worth every step, every twist of the wrist, every dirty dish. Particularly when I slid my spoon through the glossy puddle of caramel and took that first Mozza-perfected bite. I knew without a single doubt that I'd truly scored the sweet end of the deal. Adaptations: I used dark Rum instead of Scotch whiskey, and used good quality vanilla extract instead of a vanilla bean so the procedural directions below differ a bit from the recipe in the book. I also halved the quantity of the caramel sauce and played around a bit with the proportions in the whipped cream based on a different version of the same recipe I found online. Combine the heavy whipping cream and milk in a medium bowl with a lip and set aside. In another medium bowl (yes, a second bowl - the amount of dishes you'll dirty in this recipe is daunting in itself), whisk together the egg yolks, egg and cornstarch until well integrated and frothy. Heat a large, heavy-bottomed saucepan over medium-low heat and cook the sugar, salt and 1/2 cup of water until the sugar dissolves. Turn the heat up to medium-high and continue cooking without stirring for 10 or so minutes, swirling occasionally to ensure it cooks evenly. The mixture will look a bit lava like, bubbling up and what not, but this is totally normal -- just let it keep doing its bubbling, lava-like thing until it turns a deep, dark caramel color. Reduce the heat to low and slowly add the cream/milk in a steady stream, whisking constantly to integrate with the caramelized sugar. Take caution to not add it too quickly -- the pan will be very hot and the mixture can very easily bubble over. (I know this because it bubbled over a bit for me... oops!) Continue whisking and cooking for a few more minutes over medium heat (again, attending closely to it so it doesn't boil over and make a horrible mess all over the stove and possibly the floor.) Turn off the heat, and ladle out 1 cup off the hot cream and sugar mixture and gradually add to the eggs, whisking constantly so the eggs don't scramble. Continue adding the cream until half the mixture has been incorporated, then gradually add the egg/cream back to the saucepan, continuing to whisk constantly to keep the texture smooth. (This is especially important if you plan not to strain the pudding like some of us lazy folk. Ahem, me.) Cook the custard over medium heat for a couple more minutes until it start to bubble a bit and takes on a consistency that's thick enough to coat the back of a spoon. Remove the custard from the heat and whisk in the butter and rum. Pour the cream into a medium saucepan and heat the cream over high heat until it just begins to boil. Turn off the heat and add the vanilla and butter, whisking until it melts. Meanwhile, combine the sugar, light corn syrup and 2 tablespoons water in a medium heavy-bottomed saucepan. Heat over low heat, until the sugar dissolves, then increase the heat to medium-high. Cook, without stirring, only swirling the pan from time to time so it cooks evenly, until the sugar mixture turns a deep amber color (about 7-10 minutes). Remove the caramel from the heat and gradually whisk in the cream mixture until it is thoroughly integrated. Place hot pan in an ice bath to cool then transfer to an airtight container and refrigerate. Before serving, gently warm the sauce in a small saucepan over medium-low heat. Pour the whipping cream into a medium sized bowl with tall sides. Whip it with an electric mixer until soft peaks form. Do not over whip as it will take on a stiff, buttery like texture (undesirable for this here budino). Add the sour cream and gently beat it for another minute or until the whipped cream is thick, but still soft and mousse-like. Pour a couple tablespoons of the gently warmed caramel sauce over the top of each budino. Top with a dollop of whipped cream and a sprinkle of fleur de sel or Maldon sea salt. Serve 1-2 cookies on the side. Notes: Because pine nuts are $27 a pound at my local Whole Foods, I opted to use slivered almonds instead. I also used good quality vanilla instead of a vanilla bean in the nougatine. Finally, I rolled the dough into a log to "slice and bake" the cookies rather than rolling it out and going the cookie-cutter method. Combine the butter and sugar in a standing mixer bowl (or large mixing bowl). Beat with the paddle attachment (or an electric handheld mixer if you don't own a standing one) on high speed, scraping down the sides of the bowl if it starts to crawl up the edges. Once the batter is smooth and creamy and looks slightly like peanut butter in texture (approximately 5 minutes), add the vanilla and salt and mix to incorporate. Add the flour and polenta and mix on the lowest setting until thoroughly combined. Do not over stir. Lightly flour your hands and a work surface. Knead the dough together into a ball, then roll out into a 2-inch thick log. Wrap in parchment paper or press and seal wrap and refrigerate for at least 3 hours or up to 3 days. Preheat the oven to 350 degrees. Line a baking sheet with parchment paper or a slip pad. Remove the dough from the fridge and slice into 1/4-inch thick rounds. Evenly distribute approximately an inch a part on the baking sheet, then place two rosemary tufts radiating out from the center of each cookie. Work the nougatine into thin disks about the size of a nickel and place in the center of the cookie, on top of the point where the rosemary tufts meet. Bake the cookies for 10-12 minutes or until they are golden brown around the edges and the nougatine has darkened. (My nougatine didn't get particularly dark so I just removed when the edges of the cookies looked toasty enough for my tastes.) Let cool for a minute on the sheet, then remove and cool completely on a wire rack. "What else can we do?" I thought as I started to drive my friend back to his apartment after our impromptu wine tasting at my favorite local wine shop. "Go see the giant rock at LACMA? Stage a reenactment of The Hunger Games in the middle of Pan Pacific Park? Stage a reenactment of The Hunger Games at Mozza with the bacon, goat cheese, leek pizza?" I didn't want to go home yet. I wasn't ready to be alone after spending the past 24 hours surrounded by people during a weekend trip down in Rancho Cucamonga. When I'd arrived back in LA two hours prior, I'd experienced the same sense of desperation -- the same intense craving for company to keep that high going. Almost as soon as I'd walked in the door, haphazardly throwing my overnight bag onto my bed with no intention of unpacking it, I'd started typing out the text message. "What are you doing right now?" I'd asked him. "Do you want to go to a blind wine tasting at DomaineLA?" I couldn't fathom turning off the social energy that had been surging through my veins ever since my weekend had launched into gear with dinner that Friday night, and as I drove up to his apartment building two hours later, it was still there -- still fuming out of my nostrils like a dragon's fiery breath. "Don't leave me yet! I can't go back to the monotony of cleaning/unpacking/mail-sorting! Distract me! Play with me! Keep these unprecedented extrovertedness alive before I stifle it with a sweatpants, a face mask and 'Mad Men!'" "Well, thanks for suggesting this," He said, pulling on the door handle to exit my car. I wanted to protest, to scream, "Wait! There's still 7 more hours in the day! We can go hike Runyon Canyon and mock the people wearing bug glasses! We can go drink more wine and pontificate on the subtle nuances of the Pinot Noir! We can go on a road trip... to the Target on Santa Monica and La Brea!" Instead, I chirped back an overly enthusiastic "You're welcome," ignoring my impulse to super glue him to the seat. As soon as I got home, the desperation to find company -- or at the very least, distraction -- came back. I blasted Rihanna on repeat while I started violently chopping celery and red onion to make curried couscous for my weekday lunches. I frantically tossed oats with nuts and brown sugar to start a fresh batch of granola for my morning Greek yogurt. "Keep moving," I told myself, hoping the blur of activity would take my mind off how quiet it was in my apartment. The discrepancy was too great. After a weekend of wine and lobster pops and fried chicken & waffles and 1 a.m. conversations about tacos, the sudden aloneness was almost traumatizing. The gap could only be filled with one thing -- food. The social engagement that comes from chopping and mincing and sauteing and spending an hour or more on something that brings a different kind of fulfillment. Last week, after a particularly long day at work, I found fulfillment in the form of this recipe for Red Quinoa and Lentil Pilaf from Chef Akasha Richmond via Food & Wine. The hectic pace of the day demanded an alternative kind of hecticness. A recipe that involved far too many steps for a Wednesday night at 9:00 p.m. It brought me back to regular speed, back to normalcy, back to a place where the silent hum of my apartment didn't register as a threat to my sanity. It registered as home -- a place where I didn't need to find anything else to do. Notes: I doubled the amount of garlic, quinoa, shallots, carrot, celery, and parsley, and also increased the amount of caulilflower. I didn't have coconut oil so used coconut chips to give the dish a tropical flavor -- an appropriate substitution in my mind. (Though I have been on a bit of a coconut chip kick in general so have been finding ways to incorporate it into everything.) Finally, I used dried thyme instead of a fresh sprig (I'm not currently stocking sprigs), and regular slivered almonds instead of Marcona. Clean out the pot and then heat over medium-high heat. Once hot, add 1 tablespoon of the olive oil, swirling to coat the base of the pan. Add the shallot, celery and carrot and cook over low heat, stirring frequently, until tender and slightly caramelized, but not brown. (About 8-10 minutes.) Add the quinoa and cook for another couple minutes so the kernels take on a toasty quality. Add the vegetable broth and bring it to a boil. Cover the pot and simmer over low heat until all the liquid has been absorbed and the shells have separated from the quinoa kernels. (About 25-30 minutes) Remove the lid, fluff with a fork and let rest for 10-15 minutes to "dry out" a bit. Heat a large nonstick skillet over medium-high heat. Once hot, add the remaining tablespoon of olive oil, swirling to coat the base of the pan. Add the cauliflower and coconut chips and season with a pinch of salt and some generous shakes of pepper. Continue cooking over medium-high heat, stirring every minute or so for even browning. When the cauliflower has attained some color and lost its sharp bite (about 5 minutes or so), toss in the lentils, quinoa, parley, and almonds. Stir to combine. Serve immediately or at room temperature.